halloween is a fun time of year. you can carve pumpkins, dress up like anything you wish, get free candy, eat things made with pumpkin, what is there not to love? i also want to wish my wonderful niece a happy 13th birthday! i can't believe she is a teenager. brand-eye etsy shop now open! i put one lonely item in my etsy shop brand eye over the weekend, but it sold already! tonight i added two more vintage items. i only buy what i love, so it's going to be hard to let each item go. i am already regretting selling the vintage pedestal bowl and it hasn't even sold yet. the handmade items are coming soon! here is the sugar and creamer set that i sold. and here is the beautiful milk glass bowl that i will be sad to part with. and filled with leaves and gourds. and another sugar and creamer set. more items are to come! so i made it to the first round of the apartment therapy fall colors contest! now i need your help (and it must be important because i used all caps). please vote for me! voting is going on until 3am friday morning. for months i have been trying to decide what sewing machine to get myself and i finally took the plunge. i got this beauty, a husqvarna viking emerald 183 . special thanks to my parents and sister for early christmas $$ so that i could get it! it has all sorts of cool stitches and even has the alphabet. sorry the pictures are terrible. it was dark and the lighting situation in my work space really needs some work. have i mentioned yet how much i love the fall? i finally did something with all of the apples we bought at the apple festival. made applesauce! it was super easy. i used a recipe from allrecipes.com and used some freshly ground cinnamon. Combine apples, water, sugar, and cinnamon in a saucepan. Cover, and cook over medium heat for 15 to 20 minutes, or until apples are soft. Allow to cool, then mash with a fork or potato masher. i've been addicted to apple cider lately. i had one from starbucks saturday and it sucked. homemade is so much better. all you have to do is: buy apple cider at the store, add about 1/4 tsp orange zest and spike the orange with cloves, add cinnamon and brown sugar to taste. heat all ingredients in a saucepan over low heat. you can also add some spiced rum or jack daniel's. one of my favorite occasions to decorate for is the fall season and halloween. the best part about it is that you can use nature to help you out. and you're not buying any plastic or garbage that will end up in a landfill. when it's over, just toss it in your compost bin, or throw it in the woods to decompose. 1-if you are surrounded by trees, you can take a walk right out your door. if not, take a walk to a park or any area that has trees with colorful leaves. collect leaves that look beautiful to you. you can stick to one color or type, or like i did, pick a couple different kinds. 2-use a plate that will work well to hold the leaves. i used a flat glass candle holder plate that i picked up from pier 1 a couple of years ago. 3-cover the plate with a few of the larger leaves. 4-add gourds, small pumpkins or apples. odd numbers of items work the best. 5-fill in with more leaves. that's it! it takes about 5 minutes to do. you can also add other things such as acorns, pine cones, anything that you'd like. 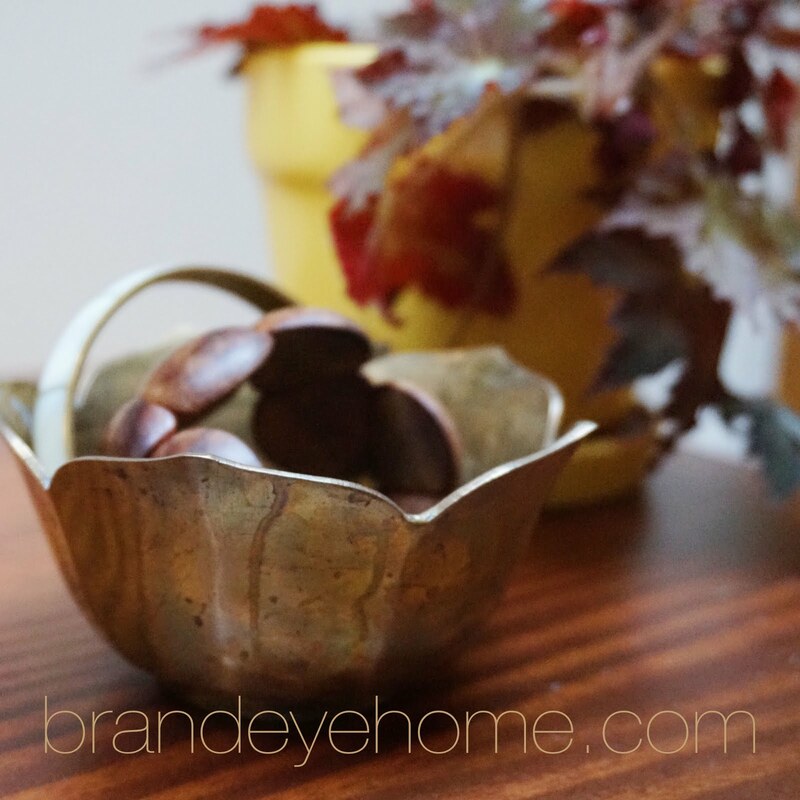 what's your favorite item to use for fall decoration? on they way we drove through an area where trees with yellow and green leaves were framing the road, it was beautiful. corner of winesap and cider press junction in the festival. as you can guess the festival is centered around apples, actually for miles and miles around there are apple orchards. it's like the napa valley of apples, if only they made wine! and here is where we got our pumpkins, a little house that sells fruit, veggies and plants in lewisberry. they had some really awesome pumpkins. and this is the same road that hours earlier we were pulled over by a cop, i was speeding. whoops! after driving on the turnpike for a couple hours you forget that you can't drive that fast everywhere. i was lucky though and he only gave me a warning. that never happens to me. he must have been threatened by moz in the car who was growling and barking at him. haha. sorry cop! as you can see, my office/work space is where all of the stuff i buy, that dave hates, ends up. it still needs some work, but it's getting there. coming soon is the brand-eye etsy store, i'm hoping to have it up and running by mid november. i will be selling vintage kitchenware and things i make. wish me luck! dave and i had yet another destination wedding to attend, this time it was in napa valley. we had a really great time and we had a chance to catch up with some friends that we don't get to see as much as we'd like. we stayed at roman hot springs in calistoga and waking up each morning to a swim in the hot springs was heaven on earth. this is where we spent our mornings. the wedding was really beautiful and the sky cleared just in time for the ceremony. then it was time to celebrate. we spent a day in sonoma and had a tour of quivira winery. it started to rain on us so we took cover under a tree. so we drank some more. we drove back to napa valley to have dinner at ad hoc, which, unfortunately, was an expensive disappointment. and walked around china town. and saw some friends that live in san francisco (i forgot to take pics!). we went to the newly re-opened academy of sciences in golden gate park. it was awesome. lots of really cool fish. it was a blast. i wish i could keep up this pace of a vacation every other week! it's been awesome.